Hundreds of people reported seeing a fireball meteor that lit up the night sky across parts of northern England at 9.40 p.m. on Saturday, 3 March. 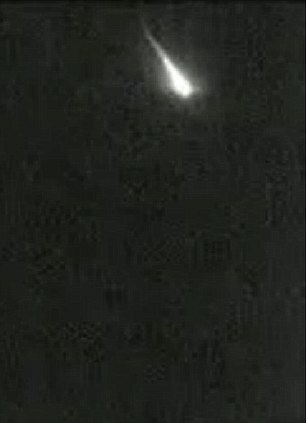 Some excellent footage of the fireball has been posted on YouTube and can be seen on the BBC website here. More eyewitness accounts and footage from webcam at Whitley Bay here. Police forces reported being inundated with calls reporting sightings from a zone stretching from Peterborough to the north of Scotland. Of interest was the interpretation initially placed on the sightings by some observers, who called police fearing that a plane had crashed. Adam Hepworth, from Argyll, told the BBC he was leaving work when he saw a bright light moving across the sky. Perceptive readers will recognise this description from accounts of numerous UFO ‘scares’, such as the Rendlesham incident and the Cosford sightings, which were sparked by fireballs and space junk respectively. Last night’s fireball was visible for more than 30 seconds, which in the past has often people to believe they are seeing an aircraft in flames, a distress flare or, in other cases, a flying saucer. The Doomsday prophecies surrounding 2012 also featured in the reactions of some who witnessed the meteor. The Guardian reported how the director of the Kielder Observatory, Gary Fildes, was with a group of 30-40 skygazers who were overcome with excitement and wanted to know if it was “going to end life on Earth”. So far the ‘UFO’ interpretation has not been mentioned, possibly because the footage clearly depicts a classic fireball meteor. The fireball was also seen by a number of astronomers including Adrian West, of Meteorwatch, who believes it may have gone down in the English Channel or the Bay of Biscay. “….The night of 31 December 1978 was cold and clear, and across the British Isles people were out of doors bringing in the New Year. A few minutes after 7.00 pm many hundreds were amazed to see a bright light with a long trail behind it streaking across the heavens on a northwest to southeast path. In the space of just a couple of hours the MoD received a total of 120 separate sighting reports and civilian UFO groups received hundreds more. The source of this spectacular flap was quickly identified by the RAF’s early warning base at Fylingdales in North Yorkshire as the re-entry into Earth’s atmosphere of a booster rocket that had launched a Russian satellite, Cosmos 1068, into orbit on Boxing Day. The rocket burned up over northern Europe, with pieces falling to the ground in Germany. “Although most observers gave a sound description of the New Year’s Eve UFO a few provided wildly inaccurate details, particularly of its size and altitude. Exact estimation of the height of an object in the dark sky is extremely difficult, if not impossible. For example, some observers believed the object was as low as 1,000 ft, when in reality it was many miles above the Earth. Others gave a time for their sighting that was one hour or more in error. This entry was posted in Uncategorized and tagged BBC, Cosford incident, meteor, Meteorwatch, Ministry of Defence, Rendlesham, UFO. Bookmark the permalink. I saw the 1978 meteor, but I remember it as being much later at night than that, any more info? The news did report it as a meteor as well. I seem to remember it was the same day/night as the New Zealand UFO flap. We’d spent the evening (New Year’s eve 1978) with my grandparents and we were walking back from their house to mine – I was with my mother (age 27 at the time) and my brother aged 4. I cannot remember the time very accurately as at that age I don’t think you really comprehend time in the way adults do. However, we’d been celebrating the New Year so it would certainly have been very late in the evening or possibly the early hours of Jan 1st 1979. The night was cold and clear and as we walked along the path shown on the map, in a northerly direction we suddenly saw this bright light in the sky. It was around 30/40 degrees elevation, you didn’t have to strain to look up to see it and it moved quite slowly from the NW to the NE going almost perpendicular to our path from left to right. It didn’t seem to be changing altitude at all, it certainly wasn’t “burning up” like other meteors I’ve seen, the sighting lasted around 30 seconds and the object vanished over the NE horizon apparantly just as big and bright as when we first spotted it and at around the same angle of elevation, ie 30-40 degrees. The object was bright, very bright, possibly as bright as the full moon and it was a white light, but not a point of light, more like a small version of the moon itself although I cannot remember any detail on the object, it was just round and white. The other odd thing was we could hear the object, it was a deep rumbling noise, nothing like anything I have ever heard before or since in my life, this was what first alerted us to the object and it stopped us dead in our tracks. Impossible to estimate altitude, size or distance of the object as there’s no point of reference or details with which to do so. There was no tail, trail etc behind the object, it moved in a straight line without deviation at a constant speed. I suspect with hindsight it’s possibly a small asteroid or comet that grazed the atmosphere and that caused it to heat up enough to glow white hot, without actually hitting the planet, can’t find anything on the internet about it. Because we could hear it I suppose it must have been fairly close but the fact we saw it for 30 seconds or so means it mustn’t have been that close if you understand my reasoning. I will speak with my mum to see if she can give a better estimate of the time and what she remembers about it. I do remember getting home and on the news there was an item about the UFO flap over New Zealand and then right at the end of the news they mentioned a meteor had been spotted over Northern England and Scotland, so this is what I possibly saw. This incident made me very interested in astronomy and it’s something I am still fascinated by. If you want more info (!?) let me know. I remember this event almost like it was yesterday. I was walking home in Glasgow (later than 7pm, probably 9-10pm) in a NNE (just looked it up on Google maps 🙂 ) direction when I saw this huge fireball in the sky, going N to E.
It was so clear I could see the flames licking off it. It was definitely spherical(ish) and about the size of the moon, so a rocket debris re-entry doesn’t really wash. If there was ever a time I regretted not having my camera with me this was one. It was an absolutely stunning sight. After about half a minute, which seemed to go in slow-motion, it burned out in an approximately easterly location..
Days later, I remember letters appearing in the Daily Record talking about a UFO sighting, which, frankly, was laughable. I agree with you. I saw this on New Year’s Eve 1978 when I was on guard duty patrolling the camp I was based at in Lancashire. I remember seeing it much later at night than 7pm. Close to midnight. David, you were standing about a half mile from myself. I was on Dryden Road and think we must have seen the same thing. Although my memory was it seemed to be very low and did have a tail (like a fireball) I remember hearing it too. From my point of view it passed right to left and I would have been heading towards your location. So if you know Scunthorpe it was heading towards Ashby. I was only 15 at the time and my memory may have changed some details, but maybe It was the same event? Sorry, I should have said left to right in the direction but I would put the time at early evening as I was walking my girlfriend to my house at the time heading north also. I’ve spoken to my mum now about this, she was 28 at the time so her memory is probably a bit more reliable as she was an adult at the time while I was a mere child! The time was earlier than I remembered, probably around 9-9:30 PM or so as we saw the 10 O’Clock news when we got back home and that had a report of the New Zealand UFO flap. Everything else I described is corroborated by my mother, it’s nothing to do with the NZ UFOs of course. Yes, left to right, I would have been a bit closer to it, it was heading towards Ashby. If it was low in the sky then it would be a very strange phenomenon travelling at the speed it was moving at, we watched it for around 30 seconds as it moved from the West to East. With hindsight the news report of a meteor may be a different object as from memory it mentioned the meteor travelling the length of the country (ie North to South or vice versa) and it was reported on the news as soon as I arrived home barely half an hour after my sighting – probably too quick for the news channels of that era! We could do with more eye-witness reports, how localised was the sighting etc. It’s great to have someone else who saw it and coincidently someone who was so close to my location! I suspect it was quite high and far away really. But I do remember thinking It might hit the flats at the top of the hill! Just an optical illusion I guess as we know it came down in Germany. I was amazed to see your location map today. I have told my wife about this many times in the past and she always looks at me as if she is humouring me and clearly thinks my memory is very confused! But I do remember it and the noise, direction and how low it seemed to be. It must have been really big to appear so low yet be quite high. Thanks for confirming my memories. It’s nice to know I wasn’t imagining it! I remember seeing the meteor. I was at home for Christmas, in Wigan, and had been out, I remember it was sometime around 8pm. In my memory it was quite a stunning sight and BIG. Typically there was no one around at the time to share it with. When I got back to college in Sunderland I mentioned it to a friend, she had seen it only 10 minutes or so after I had. Nice to know others saw it too. It was quite a sight and hard to get over to others just how dramatic it was. I was driving north from Glencoe towards Kyle to join friends for Hogmanay, The night was cold & crystal clear with a million stars all around.I saw the bright light moving across the sky, left to right. My reaction was, “what the f— is that”. stopped the car and got out as it vanished over the horizon. It was like nothing I have seen before or since and would love to believe it was a UFO.. I have the worst eyesight you can imagine and I didn’t have any glasses on that night. I was standing at a bustop in Birkenhead and one of the others at the bustop pointed it out to me and I could see it it was that big. The flames from it seemed dull but that wasnt due to my eyes as I see color very well. I was on my way to a pub so it would have been anytime after seven. All my mates had also seen when i got to the pub. I remember seeing the bright light streaking through the sky on New Years Eve 1978. It was a spectacular sight with an amazing array of colours trailing behind it. Its interesting to get an explanation all these years later. However just a short while later I saw something completely unrelated and unexplained as I walked along the canal at the side of the Goyt Mill in Marple Cheshire. The mill was on my left and the golf course on my right. Hovering very slowly over the golf course was a very bright light which seemed to move in a similar manner to a helicopter. The mivement looked slow and deliberate. It stopped for a few minutes before accelerating to a phenomenal speed passing from the golf course side of the canal and passing out of sight behind the Goyt Mill. The strangest thing is the “aircraft” didnt make make any sound at all. At about 21.15 to 21.30 hours I left my brother in laws house to collect my wife from Sheffield. My brother in law and 13 year old niece walked me to my car. As we got to the road we all heard a sound and looked up towards it. A very large bright silvery white object flew low and slowly towards us and from where we stood it looked round at the front and tapered towards the rear. I remember seeing other colours also but in the main it was as described above. My niece was very frightened and hid behind my brother in law and I. We watched it pass over from our left to right position still making the same sound. As we watched the object changed direction increased altitude and went from travelling slowly to great speed and was gone. We did not see any fire ball to suggest it was anything other than described. The total time of the sighting is hard to remember but at least a minute. In those days we did not have smart phones and not many people carried film cameras on them so we have no means to corroborate the sighting independently. I collected my wife from Sheffield very excited about what I had seen and went back to my brother in laws home. He was into radio and from memory he said something was going on in New Zealand or possibly Oz and I am sure he mentioned RAF Finingly near Doncaster. By now the time would have 22.45 hours we still had to drive home that night and we had not been drinking any alcohol that evening. We moved from Yorkshire and time passes, some twenty years later I met our niece at a family reunion. She brought up the subject of new years eve 1978 and I was amazed how vivid and clear her memory of that evening was and it confirmed all I had seen. I had never seen anything about it on the internet before. So I am just glad to see some one else apart from us three saw something that “made a noise and was large”. We saw it changed direction and increased speed and altitude new years eve 1978. It will take a lot to convince me it was a comet or space junk falling to earth, a weather balloon or cloud atmospherics. Hi Mac, I’m 100% convinced what I saw was the Cosmos debris re-entering the atmosphere. It was a large fireball and made a rumbling sound of the sort you would expect from a large object burning up. It didn’t change altitude or speed, just flew straight across the sky from horizon to horizon. Pretty spectacular I can tell you, but I don’t think we saw the same thing at all. We may have seen something different. But I was amazed when my niece mentioned the subject many years later and discribed exactly what I had also seen without any prompting by myself. I had thought we three, my Brother in law, my niece and I had been the only ones to witness something large ,close and that made a sound that evening. I had seen no other reports of it on the internet until now. We was on the then outskirts of the city of Sheffield and I was sure someone else must have seen something also, but I never found any mention of anything until now. Me and my wife where walking home after taking the grandson home when we saw a gereen blueish light in the sky thought it was a firework we wher waiting for the bang but didn’t happen the wife thought it was alien ship lol watched it for about a minute then seemed to break up but it was seen over Scotland must have been a big chunk ov rock to give us a show like that.